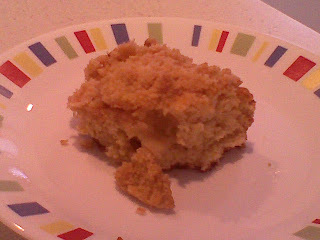 Apples, cake, cinnamon, crumbs - what more could a girl want? A scoop of vanilla ice cream, maybe. I was looking around for a cake recipe that, of course, included only ingredients I could currently find in the house - and I stumbled across this recipe for Quick Apple Streusel Coffee Cake on the food network website and I thought I'd give it a shot. I feel like I don't do many cakes here - I do alot of cookies and cupcakes and muffins - but I only have a few cakes - and most of them focusing on the decorating aspect. Cake are great because they're often less time consuming and difficult - one pan, in the oven, and you're done! Of course, there are plenty of difficult cakes out there as well. Back to this cake - it was pretty good, sweet and light, with the right balance of apple to cake. The topping wasn't as crumb like as I would have thought - it ended up being more of a crispy layer on top than a traditional crumb cake. It was still good, but if you wanted to change you could probably double the amount of butter in the topping to 4 tablespoons. Happy eating - and if you have any great and simple cake recipes send them my way! Tip of the Day: In recipes calling for apples, try using two or three different types for variety in the dish. Mix together the flour, baking powder, sugar, salt and cinnamon in a bowl. In a separate bowl, beat together the egg, milk and shortening. Pour the wet ingredients in to the dry ingredients, and stir until combined. Stir in the chopped apples. 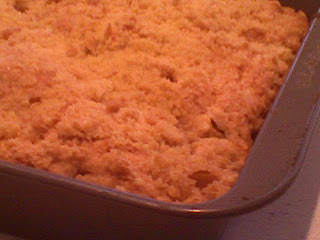 Pour the batter in to an 8 inch square pan and bake at 400 F for 25 to 30 minutes.